The Ask Leo! Guide to Staying Safe on the Internet – FREE Edition – Registration - Ask Leo! Thank you for registering The Ask Leo! Guide to Staying Safe on the Internet – FREE Edition. Visit The Ask Leo! 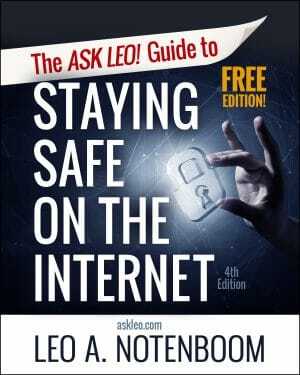 Guide to Staying Safe on the Internet – FREE Edition in The Ask Leo! Store. You will not be charged, this book is free. Add a copy to your shopping cart. You will not be charged, this book is free. Check out normally. You will not be charged, this book is free. As you check out, make sure to create an account, if you do not already have one, or login to your existing askleo.com (not members.askleo.com1) account. Once checkout is complete you’re registered! Login to your askleo.com account (using the link at the top of every page on askleo.com), and you’ll be able to access all the benefits and bonuses. 1: These are two different accounts with two different logins. The askleo.com login page describes the situation.